Darling of the environmentalists, bringer of the future, the Toyota Prius isn't merely transport; it's a statement of your concern for the environment and intent on doing something about it. Darling of the environmentalists, bringer of the future, the Toyota Prius isn't merely transport; it's a statement of your concern for the environment and intent on doing something about it. This second-generation car was a huge hit worldwide, and uses an updated version of Toyota's Hybrid Synergy Drive system, which mates an electric motor with a conventional 1.5-litre petrol unit to allow it tree-hugging emissions and economy figures. Even its shape is dictated by efficiency, the slightly odd proportions creating the least drag possible to minimise the energy needed by the Prius' powertrain. It was undoubtedly a ground-breaking car, though many of its contemporary turbodiesel rivals manage similar (if not better) fuel economy figures, and are less compromised to drive. 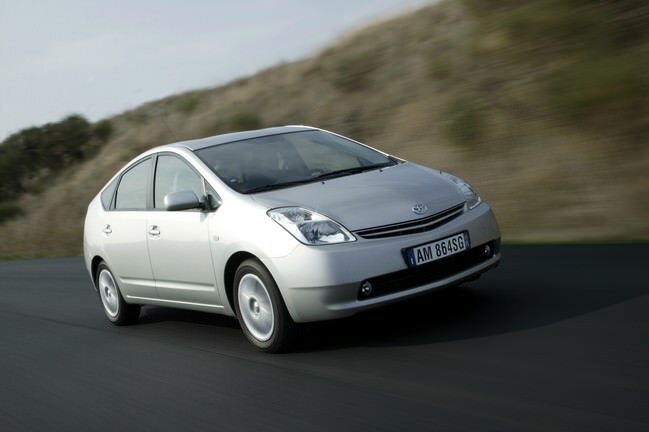 Back in 2003 the idea of hybrid powertrains - in Europe at least - was fairly revolutionary and the Prius was and remains the most recognised hybrid car on sale. It uses a battery pack and electric motor to assist the conventional petrol engine, scavenging back power when braking, coasting or via the engine idling. Some later models in this generation of Prius adopted plug-in technology, allowing it to run on electricity alone for longer periods, but the majority of these cars remained in the ownership of Toyota and were leased to businesses on trial. The model range is limited then to one drivetrain option - that being a 1.5-litre petrol engine mated to an electric hybrid drive system. The result is a car that offers an official combined consumption figure of 4.3 litres/100km and CO2 emissions of just 104g/km. That's core to the appeal of the Prius, meaning low running costs and tax bills. The reality is that to achieve anything approaching that official consumption figure you really do need to adapt your driving style, which, to many, is part of the appeal. Given its futuristic drivetrain it's hardly a surprise to find that inside it's got a digital dashboard, a weird oval steering wheel and a central screen taking care of the infotainment - and also showing a trip computer infographic that outlines the status of the hybrid system. There's only one drivetrain, and all are automatics so it's simply down to specification, colour choice, proximity and price. There are plenty around used, so finding one to suit all your requirements shouldn't be too much trouble. Toyota's once revolutionary Prius looks relatively ordinary now as hybrids are no longer a rarity. Still worthwhile if you want to make a statement about your green leanings, but the reality is that one of its contemporary diesel hatchback rivals will offer much the same - if not better - economy in the real world, and drive more conventionally too.